Fake snow is so simple to make and provides a rich sensory experience for kids. This fake snow writing tray is perfect for the winter as kids can practice some of their pre-handwriting skills all while engaging the senses. 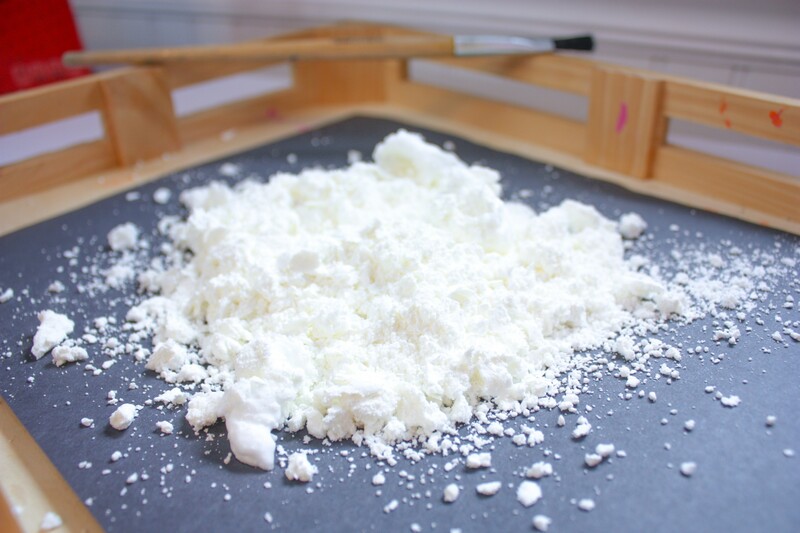 To make fake snow, mix 2 parts shaving cream to 1 part cornstarch. Mix well with hands or stir with a spoon until the cornstarch clumps but remains crumbly. 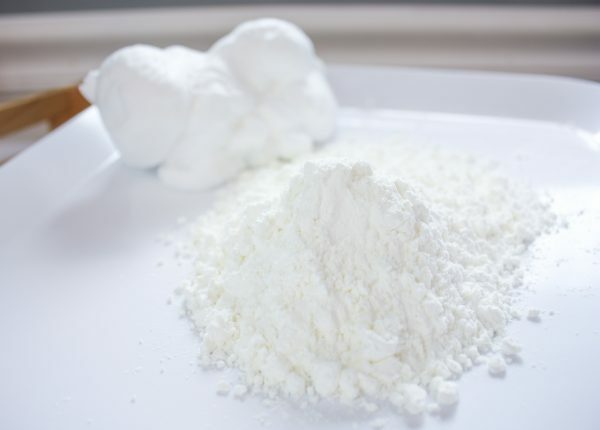 If the mixture seems too wet, add more cornstarch, if the mixture is too dry, add more shaving cream. 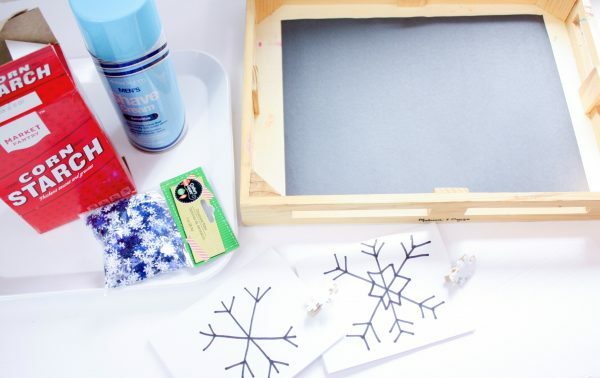 Prepare the writing tray by placing a sheet of dark paper onto a tray (if the tray is light). This helps the children see what they are writing in the fake snow. Provide visuals such as drawn snowflakes or letters for the kids to practice copying. 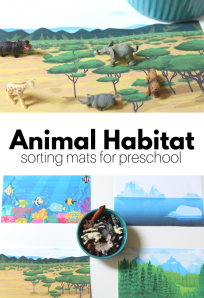 This process helps children pay attention to detail and copy a pattern. Place the visual where the child can see and easily refer to it, such as clipped to the back of the writing tray. 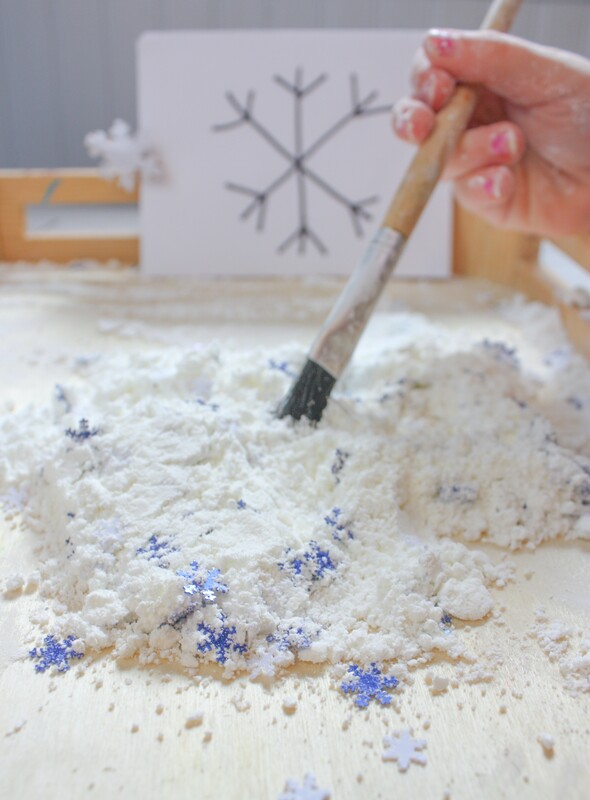 Adding some snowflake confetti to the fake snow is a nice, exciting addition as well! 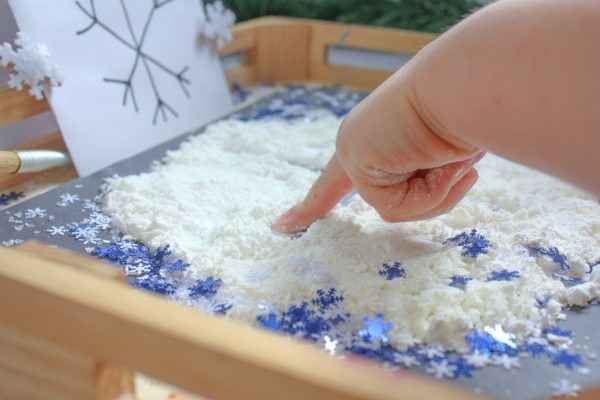 For children who do not like the texture of the fake snow against their finger as they write in the tray, provide tools such as a paintbrush for them to use. They can experiment with using the bristles or the blunt end of the brush. Traditionally, salt trays are used to practice writing letters in a multi-sensory fashion. In addition to pre-handwriting practice, writing trays provide the opportunity to build fine motor skills. 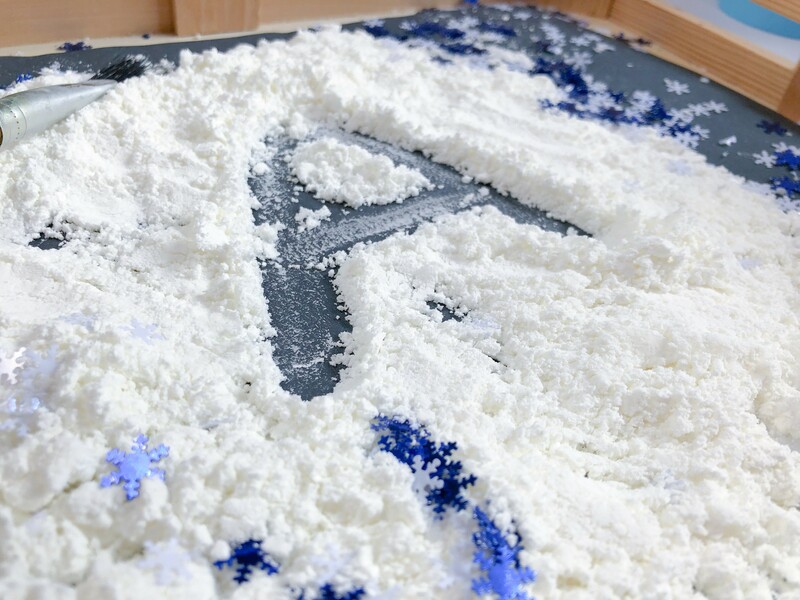 Kids can write in the fake snow, ”˜erase”™, and write all over again! This process can remove some of the frustration that some children might feel with learning to write. 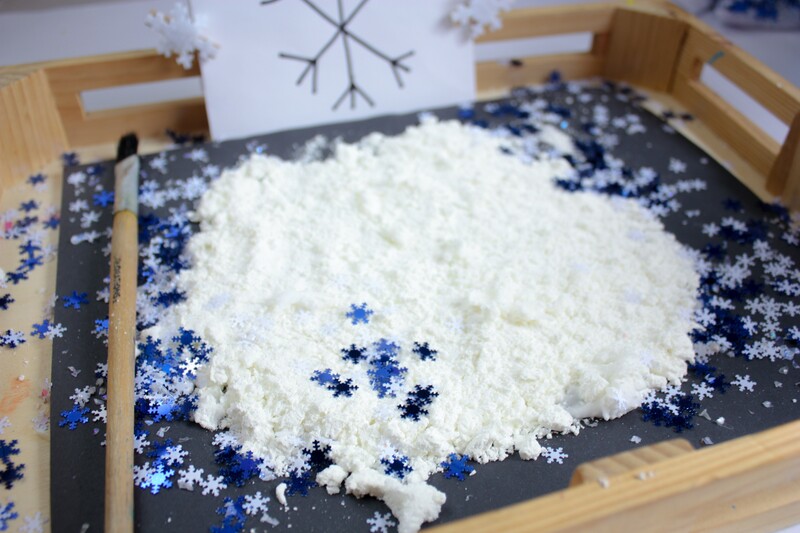 After the children have finished drawing or writing in the fake snow, the mixture makes for some fun sensory play to squish and mold! 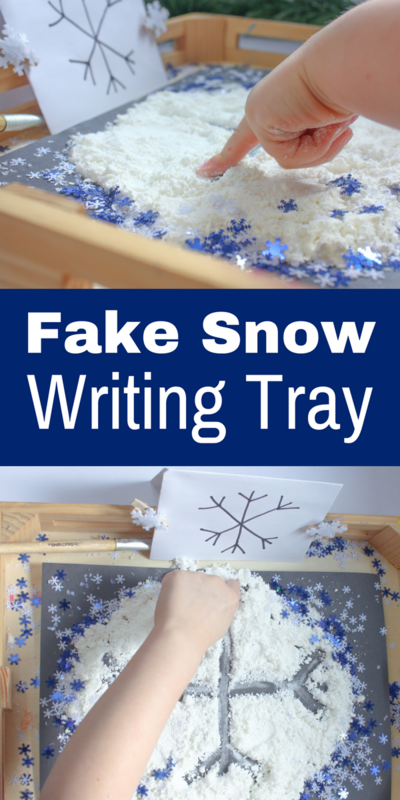 Enjoy learning and playing in this fake snow writing tray! Next Post: Roll & Cover Santa Math Game – Free Printable Game!